Empirical were formed in 2007 and are known for producing forward looking, risk taking, creative music. Their work was recognised with a MOBO award in 2010 for Best Jazz Act and they received the inaugural Golubovich Jazz Scholars fellowship at Trinity Laban Conservatoire of Music and Dance in 2011. Pop-up Jazz Lounge was an event first held by Empirical in London’s Old Street Station in February 2016; over six days they performed 24 sets to nearly 3000 new audiences. We first worked with Empirical in 2008 with a Small Grant to undertake a US tour and band member Nathaniel Facey was selected for Serious’ Take Five programme in 2009. 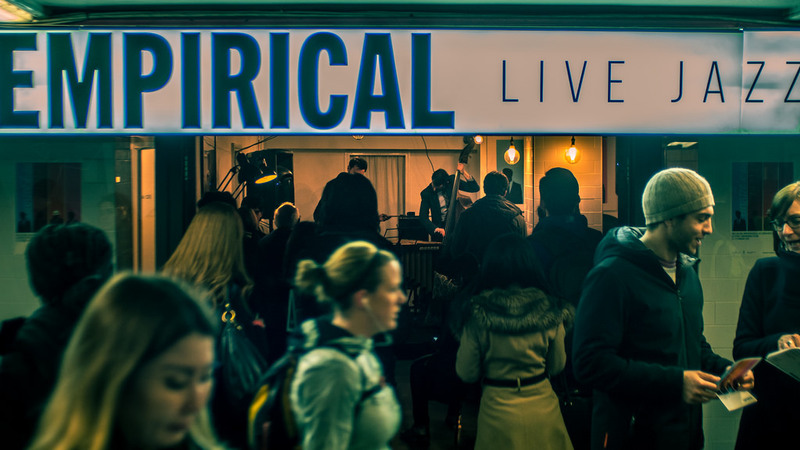 Our support is for Empirical to take Pop-up Jazz lounge nationwide, with performances in Liverpool, London’s Kings Cross and Birmingham. The project is an entrepreneurial way to increase Empirical’s exposure and to take jazz to new audiences. Its intensive structure will mimic the fertile environment of the Jazz Age, enabling them to shape their work through frequent performance and creative development. Pop-up Jazz Lounge is also supported by The Musicians’ Company, Town Hall Symphony Hall Birmingham and Arts Council England.